Southeastern Wisconsin is the primary gateway for invasive species into our state due to the high rate of roadway travel to and from Illinois as well as the maritime traffic into the Port of Milwaukee from Lake Michigan. The rapid urbanization of land in southeastern Wisconsin also increases habitat availability for invasives. The landscape in our region ranges from densely populated urban to rural agricultural with fragmented forests, wetlands, and prairie remnants. An estimated 5 new invasive plant and animal species may be entering the region each year. Small-scale efforts to control invasive plant and animal populations in southeastern Wisconsin have been employed by dedicated individuals and organizations for decades, and in June 2007 a Cooperative Weed Management Area (CWMA) was formed to integrate invasive plant and animal management resources across jurisdictional boundaries to benefit the entire region. Functioning as a CWMA, the Southeastern Wisconsin Invasive Species Consortium, Inc. (SEWISC) is a broad-based coalition that promotes efficient and effective management of invasive species throughout an 8-county region (Sheboygan, Washington, Ozaukee, Waukesha, Milwaukee, Walworth, Racine, and Kenosha). SEWISC provides the opportunity for partners to share and leverage limited resources, raise awareness about invasive species problems, and provide a mechanism for collaborative problem-solving on both public and private lands. 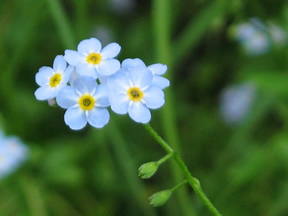 Forget Me Not invades via sticky seeds transported far and wide by humans and animals. To-date, more than 150 individuals representing private and corporate interests have partnered through SEWISC and I am honored to work with them toward accomplishing our mission to educate the public and protect the biodiversity and ecological function of southeastern Wisconsin.